Whether they’re munching on your Corn Flakes or chomping through cotton crops, weevils certainly aren’t the most popular critters around. 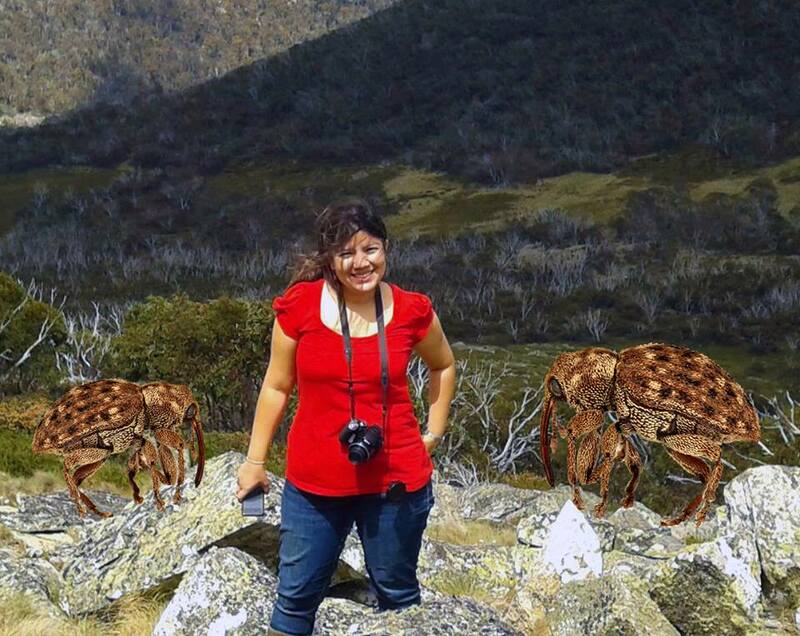 But not all weevils are so destructive – in fact some are quite useful – and Postdoctoral Fellow Dr Sara Pinzon-Navarro is on a mission to prove this. With thirteen years of weevil expertise under her belt, this self-confessed bug enthusiast is looking at how seed eating weevils could be used to protect our environment from unwanted weeds. Sara is studying the weevils at our Australian National Insect Collection to help determine how they might control the invasive Acacia tree (or wattle) in South Africa. “Australian Acacias were introduced into South Africa in the nineteenth century to provide firewood, control erosion and act as wind breaks. But without any natural pests, the wattles were very successful – so successful that fourteen species of Acacia are now noxious weeds in the country. Since Acacias grow rapidly and are resistant to slashing and cutting, they are very difficult to eradicate,” says Sara. And that’s where the weevils come in. Weevils are tiny little beetles (between 3-5 mm) with a peculiar long snout which they use to burrow small holes into seeds and bark where they deposit their eggs deep inside. Their long snouts allow the eggs to be better protected than ones laid on surfaces. To find out which species could be used to control the invasive Acacias in South Africa, Sara is examining the evolutionary history and specificity of the Acacia seed eating weevils, formally known as Melanterius. Using beating sheets (which are a bit like a butterfly net) Sara spent eight months collecting weevils from around Australia. Now back in the lab, she is identifying weevil species by molecular analysis and looking at their morphology and shape. After analysing some 3000 specimens, Sara expects to find at least some weevil species which can be used to control the Acacias. Originally from Panama in Central America, Sara has travelled across the globe in the name of weevil research. She completed her Bachelor of Biology in Mexico, and worked as a entomologist at the Smithsonian in Panama. She later completed her PhD in the evolution of seed feeding weevils at Imperial College London before joining us in Canberra. Published on CSIRO Blog March 2014.